Happidrome Four was presented at the former WW2 RAF Dry Tree radar station on the Lizard peninsular in Cornwall. It involved five artists creating and presenting new work in response to the site over the weekend of 11-12 September 2010. Delivered in partnership with Natural England, (who manage the area as part of the 5,000 acre Lizard National Nature Reserve), the project attracted support from Arts Council England, Cornwall Council’s Feast touring arts programme and in-kind support from a local renewables company, Kraft Maus, who generated green energy for the event using wind and solar power. Organised by artist, Sara Bowler, Happidrome Four was the fourth manifestation at the site since 2007. The weather was excellent (always a benefit with outdoor events) and helped in attracting 180 people over two days. Average daily visitors to the reserve are 35-50 in early autumn, mostly dog walkers. Many families attended specifically as a result of targeting publicity at schools (via Natural England’s Outreach Officer) and through posters placed in local villages the weekend before. Local press coverage aided awareness as did listings on several local community and magazine websites. The overall consensus from visitors, artists and partners was highly positive. Sovay Berriman utilised TS Eliot’s The Waste Land as part of on ongoing series of ‘readings’ undertaken at specific locations by an actor under Sovay’s direction. Using a roofless but high walled building at the site, Eliot’s poem came alive through Laura Martin’s delivery. Presented to a highly attentive audience, the ruined setting complimented the reading, providing a highly evocative situation in which to consider the poem’s complex metropolitan metaphors. 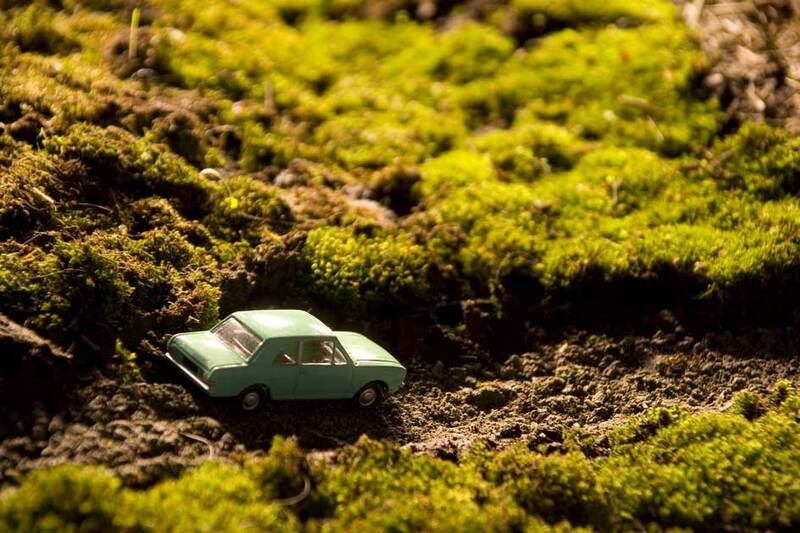 Using local soil and vegetation, Sara Bowler created a scale model of the topography of Goonhily Downs inside the Happidrome. Tiny models of people and things, animals and cars, satellite dishes and standing stones, were placed on the ‘landscape’ reflecting its long and rich history. Goonhilly Taskscape presented centuries of activity, from Bronze Age burials to twentieth century telecommunications encouraging visitors to consider the area as an evolving, living environment rather than a static entity. At Croft Noweth, an abandoned small-holding on the Downs, Sara presented the recreation of a folktale concerning its former piskey inhabitants. 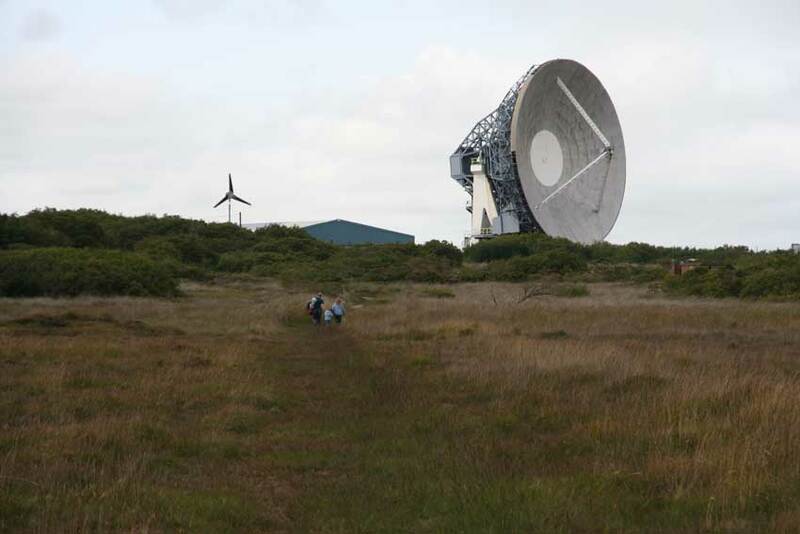 Part of her ongoing investigation into stories connected to Goonhilly, visitors were invited to step out across the heath with a map and the tale, to see if they could spot the piskeys. Dressed in leaves and flowers, the little people went about their business, watching out for any big folk who might stumble across them as they danced and played in the sunshine. 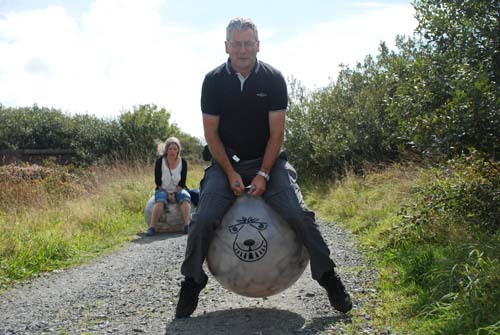 Space Hopper 2010: Travel Scheme provided an alternative mode of transport around the former RAF site by offering participants the chance to hire a hopper to bounce around a designated signposted track. Devised by Bruce Davies, it appeared to be a fun way to get around but beneath the humour, Bruce encouraged participants to consider what is ‘acceptable’ behaviour in the landscape in a challenge to the hegemony of walking as the primary motive for being outdoors. He questioned if we can develop new ways of ‘being’ in the landscape which enable us to explore and question long held assumptions about what the contemporary landscape is now for? Patrick Lowry’s ‘Hidden Agenda’ created a fictitious ‘other’ space within the Happidrome referencing the secretive nature of military activity. 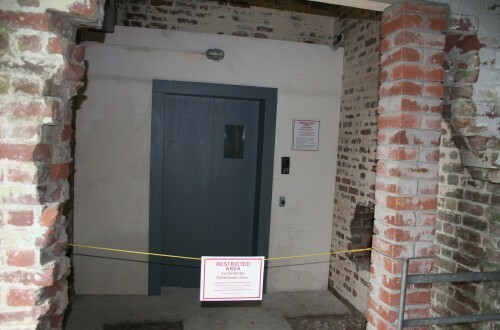 By creating a facsimilie of a lift door inside the single storey building he created the illusion that it had been part of the building for decades, yet, unlike the defunct areas of the site, continued to offer access to a still used, but secret space, where unknown activities took place. Patrick wanted to encourage the audience to consider not only the site’s history but also how it represents the hidden agendas of military activity both past and present. Also inside the Happidrome, Kate Ogley’s ‘Songs of Displacement’ was a powerfully moving audio visual work presented in the darkest space within the building. 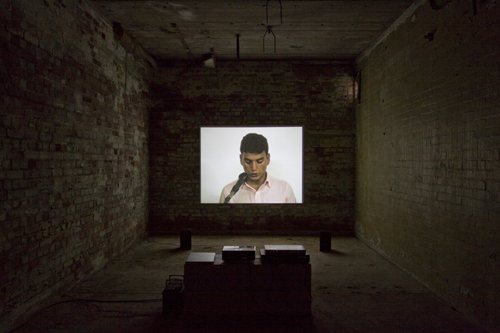 Shaped through associations of the impact of war on people, it portrayed individual asylum seekers singing a song from their homeland, an act of both remembrance and continuity. Their evocative voices filled the building throughout the weekend and brought one of the consequences of conflict – displacement – to Goonhilly, an area which historically had been home to those on the margins of society. Happidrome Four brought five artists, nearly 200 visitors, a government agency, a county council and a private business together to create a new way of considering a very distinctive area, rich in history, associations and resources. As organiser, I would like to thank all of those who contributed to a truly memorable weekend. Behind the scenes thanks are due to Elizabeth Masterton, Natural England, Claire Scott, and Jonah Kinross.